Palmerton, Penn., AT NOBO mile 1,253.9, Saturday May 3, 2014 — We’re in the “Jail House” now! Not really. The city of Palmerton puts up hikers for free In the basement of the city hall. In return, hikers must present their ID which is run through the police computers. Fair trade I’d say. 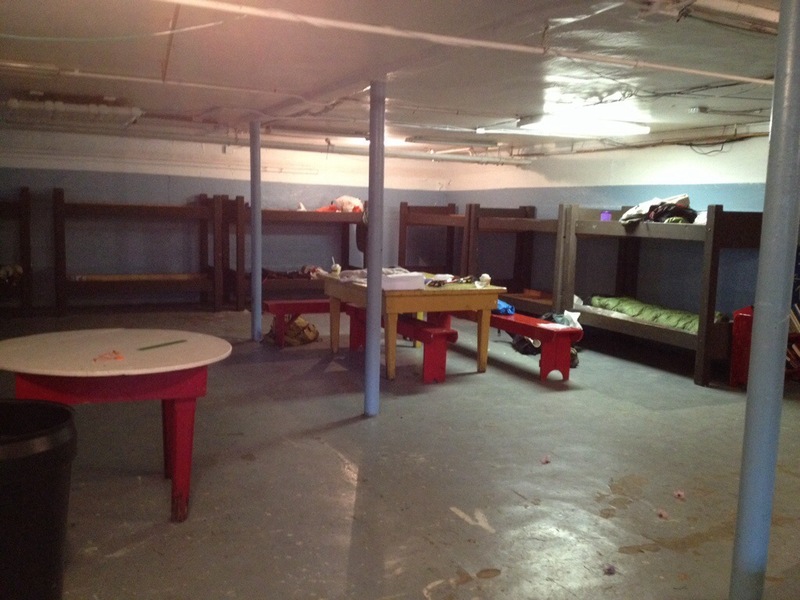 The basement hostel is a 1998 Eagle Scout project. The space never was a jail, in spite of the legend. Regardless, thanks to the citizens of Palmerton for the courtesy and comfort. The shower was HOT! Yes!!! Today we pigged out on wings, beer and burgers. Tomorrow the climb out of here is the infamous Lehigh Gap. The pain will be tremendous, but that’s tomorrow and we’ll sweat those details then. Palmerton could do so much more to attract hikers and optimize the revenue they offer. Maybe I can find a way to help when this adventure is over. These dying towns deserve a little hope. Meanwhile BUS, Swayed and I are preparing for hiker midnight – dark, which seems odd in the middle of town. Virnell, Thanks for your support! Looks like good digs. Warm, a hot shower, and a bed. Makes for a good night of sleep. Very cool Eagle Scout project. As a former Girl Scout leader who was determined to have Gold Award Scouts among my troop (and this did happen!) I like hearing go scouting projects. All the best! Such an excellent idea for an Eagle project as well as, usage of vacant space. Your blogs make for enjoyable reading. Thank you. Writing everyday helps in the sanity department.